Tues May 26: 17 mile loop - out in 60 min, and back under 58 min. Feels good to get this one under 2 hours again. I wore my racing flats. Mon May 25: 19 miles on the bike - felt good not to run! slow 9 miles on trails. Legs are tired the day after a long run. EUGENE, OR -- Students at the University of Oregon’s (UO) student recreation center will help power the school by working out on 20 retrofitted elliptical machines tied to the electrical grid. They were debuted on May 11. Tues May 19: 1 mile jog with Sumo, then 17 miles very slow. Got in a 2 hour plus run because it was my day off, but I would have preferred another rest day. Another low mileage week, but I raced Sunday and had a 17 miler on Sat ending last week. 2 decent interval workouts and a good bike ride with some climbing. Total = 64 miles. Not too bad- 2 x17 mile runs and a decent interval workout. Times on both are not where I would like- under 2 hrs on the long run and a few seconds faster on the 800s. Weekly total is up though. 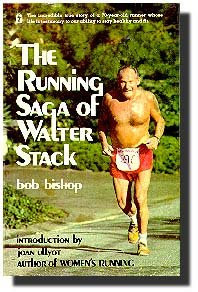 Bob Timmons Should Have Read This Book! 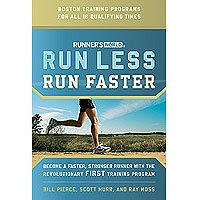 MY COMMENT: Too bad Timmons, who coached Jim Ryun in high school and college, never got to read Run Less Run Faster. His approach to training was absolutely brutal! "Some runners just couldn't handle it. they got fried, or injured, or so exhausted that they finished dead last in the championships they'd trained for all season." May 4 Mon, 1 mile with Sumo, then 4 miles easy. High winds, light rain, tired, and generally feeling one of those "why do I do this? days. Total= 5 miles. I got in a good long interval workout, a 17 mile run (2 hrs plus), and a good 10K so I cannot complain. Still, I better up the miles this week! 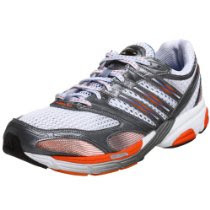 Great Deal on Adidas Boston Men's Running Shoe- $35.99! The comfort and efficiency of a well-designed, multi-purpose running shoe. Breathable mesh upper. Molded EVA sockliner for comfort. adiWEAR rubber sole offers the ultimate in high-wear durability. ClimaCool provides 360-degree cooling for the entire foot. adiPRENE+ in the forefoot maintains propulsion and efficiency. TORSION SYSTEM provides adaptive midfoot support. adiPRENE under the heel for superior cushioning at impact.